These are a few ideas I wanted to set down for you to make your trip easier. I will keep adding to these in the future. At the airport, you need only register this form with the Namibia Police and there is no fee to pay. Because we hunt in several different areas, laundry may not happen every day. You may want to bring an extra day of travel clothes. Two sets of hunting clothes should be enough. For cats, a low light scope is very helpful. Clients have had good luck with Swarovski, Leica, Zeiss and Leopold scopes. A 42-50mm front lens. Large heavy cross-hairs help with low light, or an illuminated dot is also good. Bring any rifle you can shoot comfortably and straight! The .30-06, .300 and .375 are all good choices. Premium grade soft bullets are best. Namibia is a stable, welcoming country that has won the Top Country award of Wanderlust Magazine readers in 2014 and 2019. It is a pleasure to explore beyond hunting. The Spitzkoppe hunting area is near the ocean and Swakopmund. 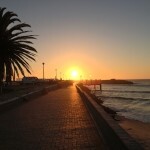 You can add a day or overnight in Swakop in your safari. You can do beach fishing or I will arrange fishing guides and boats for ocean fishing. I love fishing and will often join you! 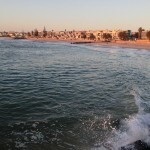 If you do not want to go fishing, there is the town of Swakopmund and the beach for relaxing and a break from safari. 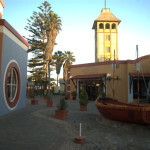 Swakopmund is a pleasant place to walk and explore. 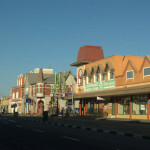 There are many shops and services available in Swakopmund.